We offer wine coolers, wine cabinets and multifunction cabinets of varying sizes for all requirements! Our quality wine cabinets accommodate 12 to 300 bottles and are fully equipped to safely store and keep all your wines. We deliver to your doorstep all over England, Wales, Scotland and Ireland. At Winestoragecompany.co.uk, we only sell original products from well established brands such as Climadiff, mQuvée, Severin and many more. We offer full national coverage with regards to service. Please read our buyers guide to purchases if you are unsure of what product would best suit your needs. If you have any questions please contact our customer service, we are happy to help! Built-in wine coolers - our quietest running units! Winestoragecompany strongly recommends – our quietest running units! Fittable wine coolers with stainless steel door and a compressor free of vibrations. Simply slot in the smaller units underneath your kitchen worktop or place the biggest unit in kitchen cupboard, to complete the task! 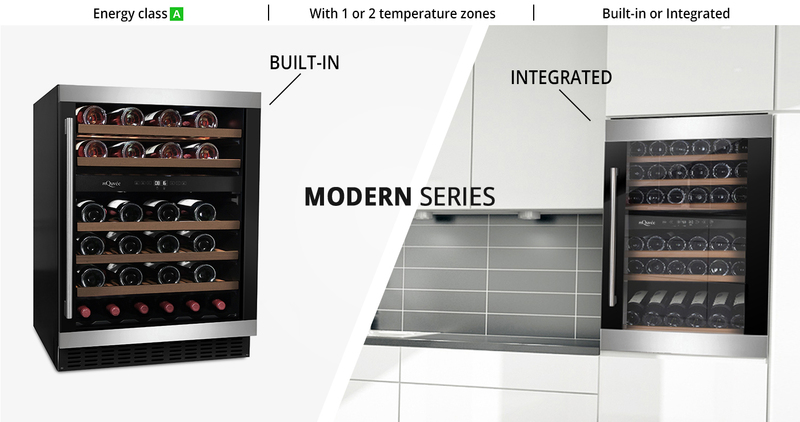 All our wine coolers, apart from the smallest unit, have two adjustable temperature zones, which enables you to store ready-to-serve white and red wines in the same fridge! The exclusive seamless door design and wooden shelves result in a stylish exterior – which unit would suit your home best! Here you find all our integrated wine coolers with a 700 mm high door – customised for the brittish market. A wine cooler with 700 mm high door gives the kitchen a cohesive appearance and fits with the other cabinet doors. A must-have in the modern Scandinavian kitchen! The wine coolers have a very low noise level and energy rating A.
WineStore from mQuvée is the wine cabinet for the true wine enthusiast. Let your wines rest safely on genuine wood shelves manufactured in Sappeli and keep track of the contents of the cabinet with the help of the elegant wine sheet on the inside of the wine cabinet. 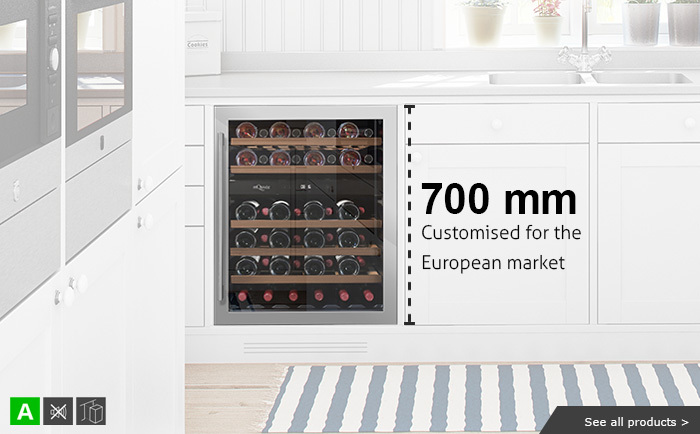 All wine cabinets are equipped with the unique opportunity to adjust the cabinet’s humidity and are available in the size up to 474 bottles. 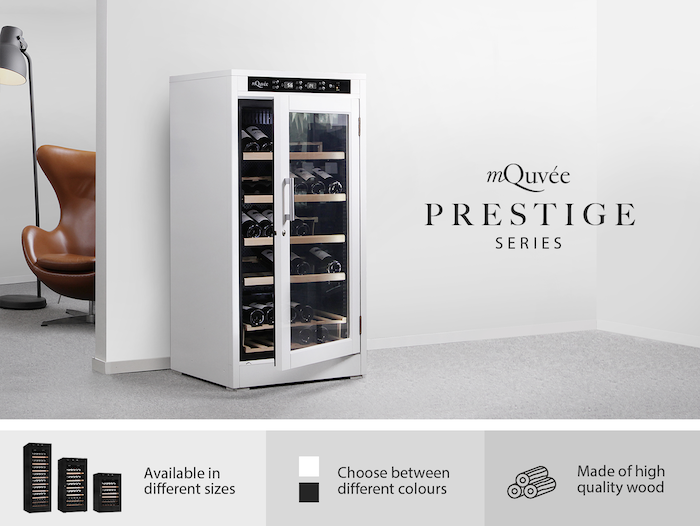 A good wine deserves to be stored in a wine cabinet from mQuvée! Classic wine coolers from Avintage, Climadiff Premium Collection, which fit perfectly under the kitchen counter. Choose between stainless steel and black wine coolers, with a completely seamless door. 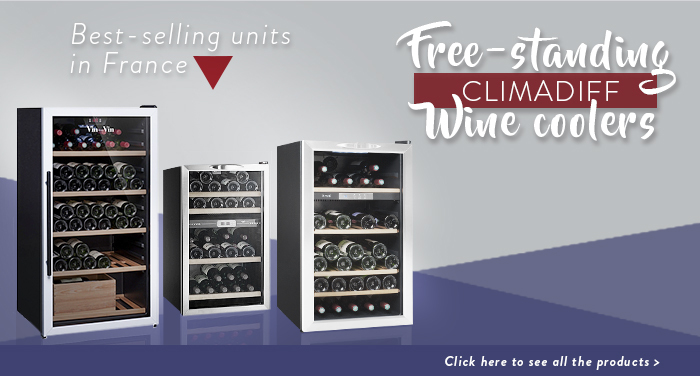 Climadiff is a leading supplier of wine coolers and wine storage cabinets and we can guarantee that you will be satisfied with their premium wine coolers in your home! All black wine coolers with exclusive wooden shelving for that superior extra touch! Perfect for installation underneath your kitchen worktop surface but equally suitable as a free-standing unit. A recent addition to our product range is the wine cooler featuring pull-out shelves which gives your kitchen a cool and modern feel! Show off your wines with a trendy wine cooler from mQuvée! The door has a combined finish in both black and stainless steel for a stylish match in the modern kitchen. Choose between a stand-alone, integrated or even a built-in unit, according to your requirements. The wine coolers are silent, come with wooden shelves, and have a carbon filter to keep unpleasant odours away from your wines. 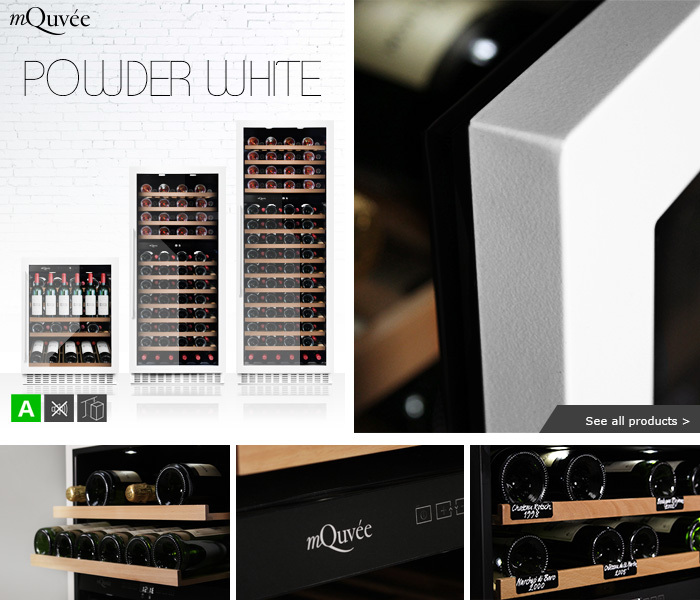 Our built-in and white wine coolers from mQuvée with the finish ’’powder white’’ give you a very exclusive and matte look. The doors feature a seamless door, which means the door doesn’t have any joints. Choose from various sizes and many different functions and features. All wine coolers, except our smallest unit, have 2 temperature zones, allowing you to store ready-to-serve white and red wines in the same cooler! A superb wine storage cabinet in solid wood (American oak) from the well-known brand mQuvée. This wine storage cabinet provides the right climate for your favourite vintages and allows them to age under the ultimate storage conditions! 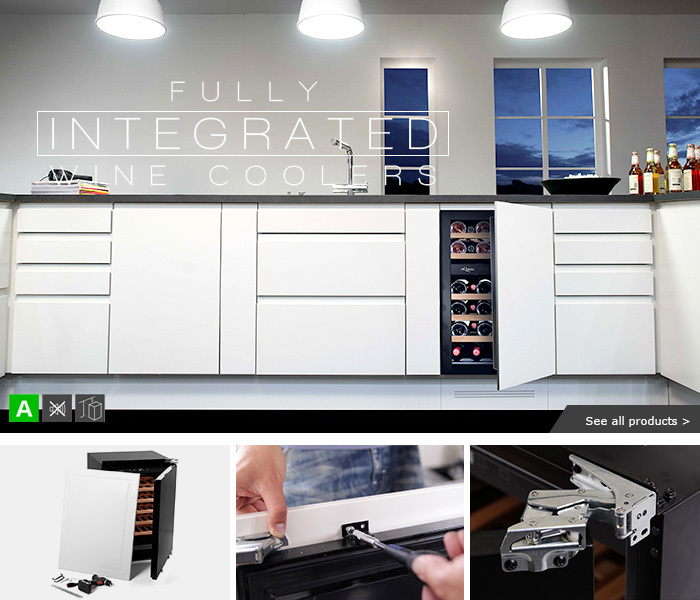 Integrated wine coolers in stainless, black or white design. The wine coolers come in the sizes 28-81 bottles and are available with 1, 2 or 3 temperature zones. Here you can safely store your wine bottles and serve them at the right temperature with the prefect dinner! We offer you the unique option to cover your wine cooler with your own cabinet door. A modern solution that gives you a clean and cohesive appearance in your kitchen! All our wine coolers have a very low noise level and energy rating A. 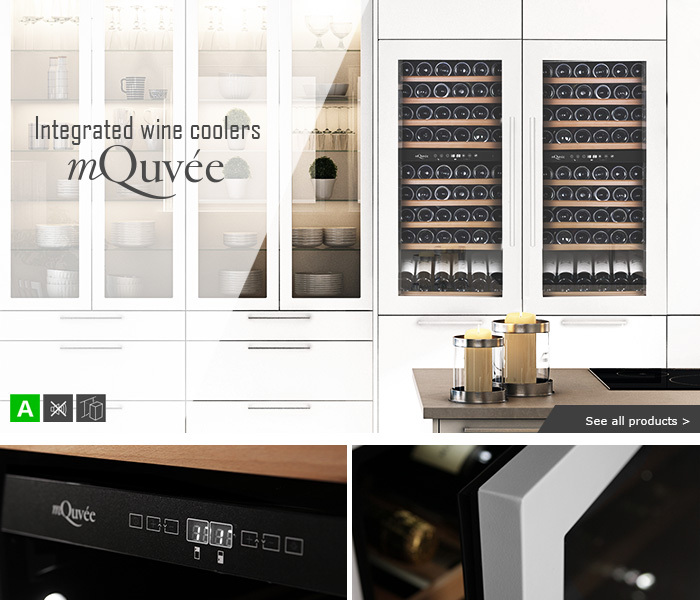 Invest in a fully integrated wine cooler from mQuvée! 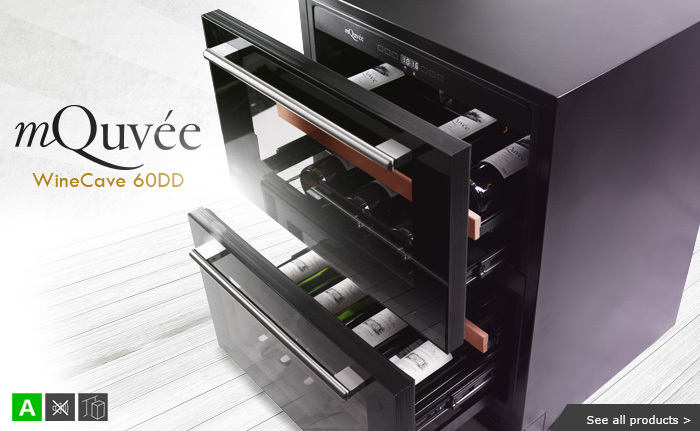 With its exclusive black design and two doors that you open by pulling out the handle like a drawer, this is a wine cooler that truly stands out from the rest! The wine cooler can be fully built in, holds 45 bottles and comes with 2 adjustable temperature zones. The wine cooler’s interior features wooden shelves and LED lighting. An exquisite wine cooler to complete the modern home. mQuvée Prestige Range - Wine cabinets in wood! Free-standing thermoelectric wine coolers – perfect for you with small space at home! Thermoelectric wine coolers in different sizes – free-standing units in classic black or stainless steel design. Place the wine cooler on the floor in your kitchen or why not in the living room. The smallest wine cooler is also ideal for hanging up, directly on the wall. All the wine coolers are perfect for you with limited space at home! 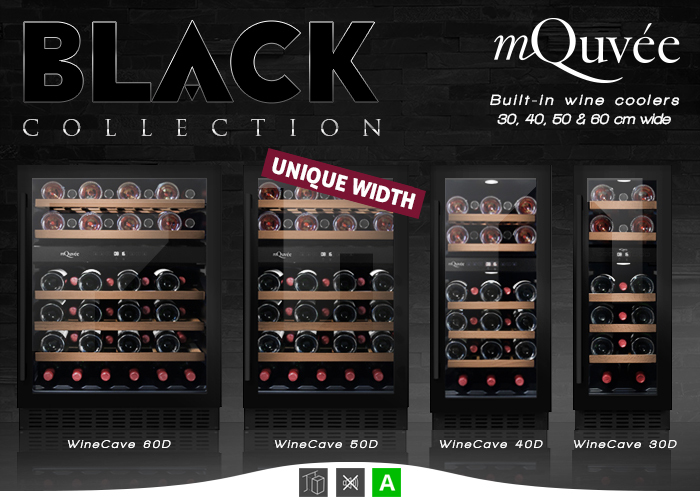 Stylish and lockable wine cabinets from mQuvée that easily can be built in or used as a free-standing units. They comes with wooden shelves, has space for 90-180 bottles and is rated with the energyclass A+. Larger size fittable wine coolers – perfect for integration into higher kitchen cupboard units, but also suitable as free-standing units. The wine coolers are perfect for someone requiring storage space for numerous wine bottles and also who requires ready-to-serve red and white wines at the correct serving temperature. 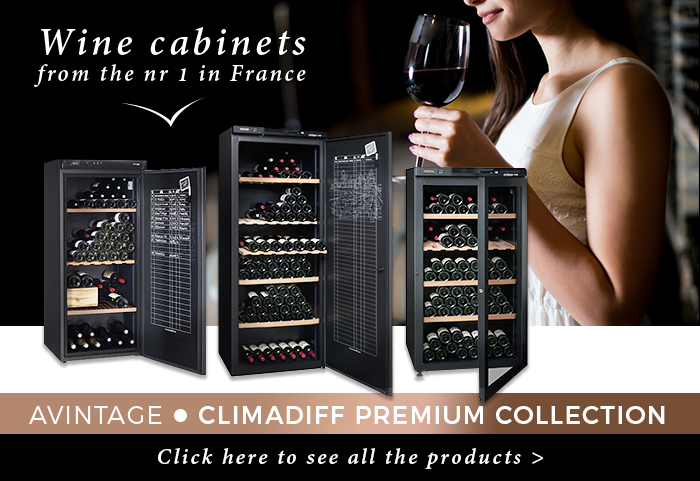 Climadiff is today one of the leading suppliers of wine coolers and wine cabinets, with Avintage as its premium brand. It's a guarantee of ours that having an Avintage in your home will provide a high level of customer satisfaction! 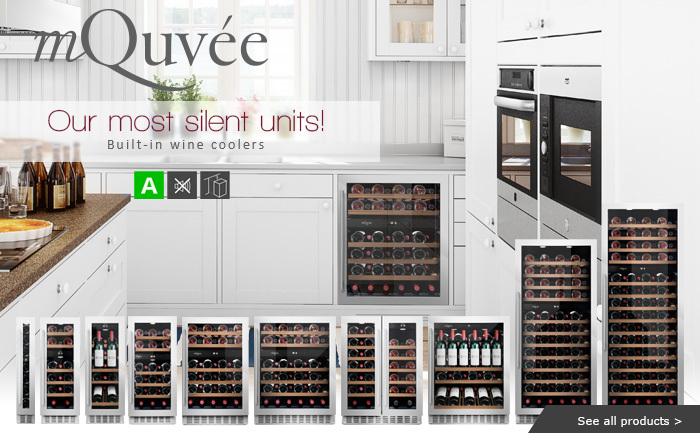 WineExpert is stylish and modern wine coolers from the European brand mQuvée. mQuvée has for years specialized in wine and its storage - you can therefore be sure that your wine bottles stored under optimal conditions. The wine coolers have UV-protected glass door, vibration-free compressor and extendable wooden shelves in the book. Energy efficient wine cabinets and multifunctional wine cabinets from French Artevino. French Artevino are specialists in wine storage and has since 1996 delivered high quality wine storage solutions to wine lovers worldwide. All cabinets are equipped with carbon filters, solid wooden shelves and lock. Space for 98-230 bottles. An integrated wine cooler will look fantastic in your kitchen! It is fitted into a kitchen unit cupboard or separate wall which enables it to blend in beautifully with the rest of the kitchen and/or wall. 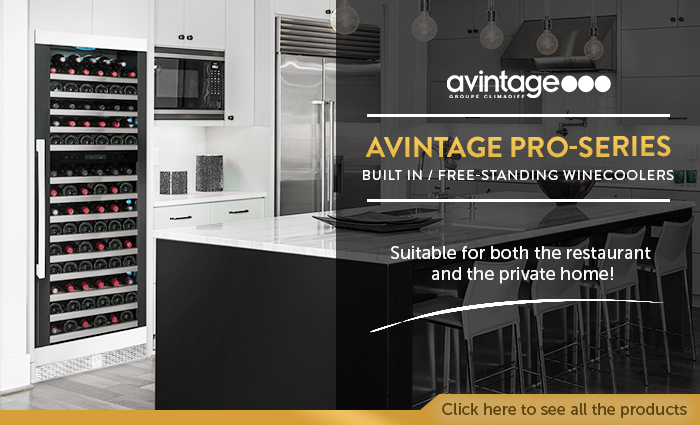 Avintage is a French premium brand from Climadiff so if you are looking for one of the best wine coolers on the market, check us out! mQuvée WineExpert is stylish and contemporary freestanding wine cooler in black design with glass front. The wine coolers are available in different sizes and comes with ergonomic handle and genuine wooden shelves. The glass door is UV-protected so that you can store your wines in the best possible way. 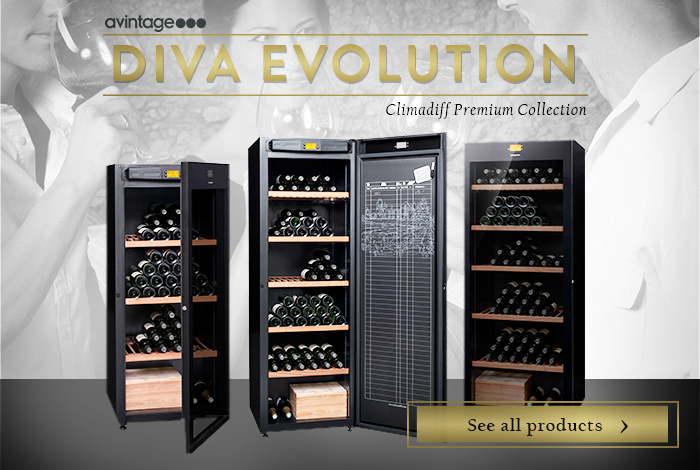 The exclusive DIVA Evolution from Climadiff's Premium Collection, Avintage! Choose between three different sizes with space for 178-294 bottles, either with mono- or multi temperature and glass- or non glass door. We offer a high capacity wine cabinet! The wine cabinet from Climadiff manages to recreate the conditions of an earth cellar and thus provides ideal storage conditions for your wines! 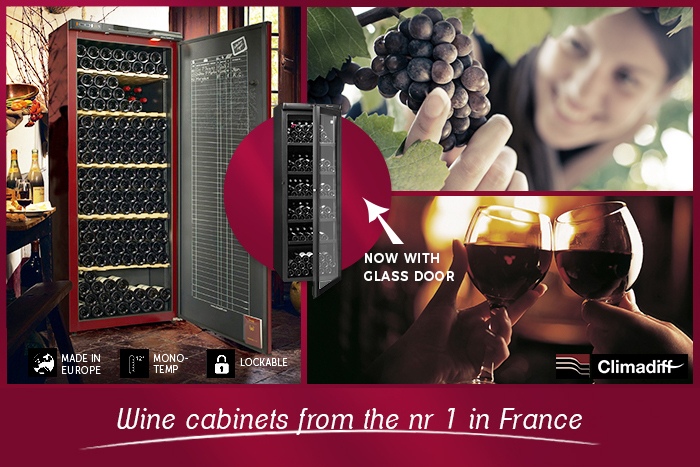 Buy your wine cabinet from the no 1 supplier in France! 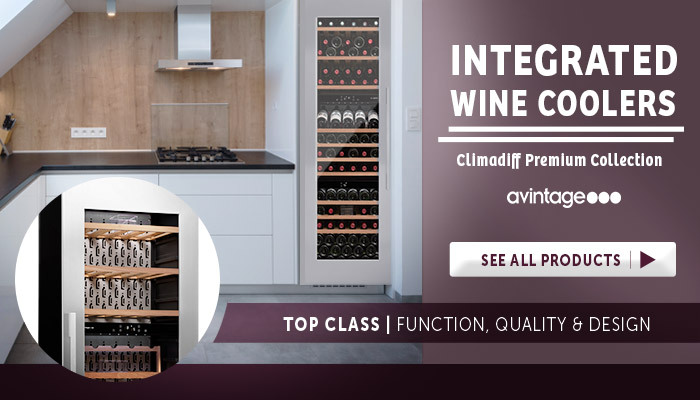 Climadiff has extensive experience from the wine storage business, and unlike many competitors, they exclusively focus their expertise on wine coolers and wine cabinets. Free-standing wine coolers with high-quality details and an exclusive display shelf - show off your favorite wines in an elegant way! The wine coolers has a carbon filter which keeps your wine safe from unwanted smells. The wine coolers also has a low noise level and energy class A. Here you will find free-standing wine coolers from Climadiff of France, non-vibration compressor system. Choose between different sizes and with one or two cooling zones – which wine cooler best suits your needs? Free-standing high quality wine coolers, available in different sizes and designs from Severin of Germany. 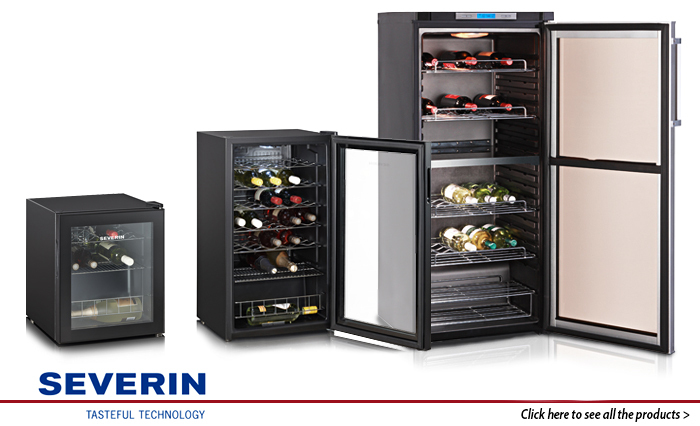 German high standard quality and user friendly products makes up the philosophy of Severin, which is noticeable when looking at the various wine coolers in this product range! Avintage wine cabinets are intended for experts, fine wine tasters and collectors with the highest of expectations! The wine cabinets are fitted with unique and modern electronics in a stylish design and are exclusively made for long-term storage of your finest bottles. This so that they are allowed to slowly reach full maturity. Fitted with a winter safety system as well as Climadiff's patented Collector-shelves made from Sapelli wood, offers something above the ordinary. Beer fridges in different sizes and designs are available here! Showcase and serve your beer bottles well-chilled and always ready-to-serve! We offer high quality beer fridges suited to private home settings as well as for restaurants and pubs. Our beer fridges hold from 110 litres up to 275 litres.